Do you ever find yourself returning to the same stamp over and over? I absolutely love this image from the Wildflower Garden set, and I can't seem to resist using it often. Perhaps because it lends itself to a number of techniques, like this distress ink "smoosh stamp" technique (see this post for more information on the technique). 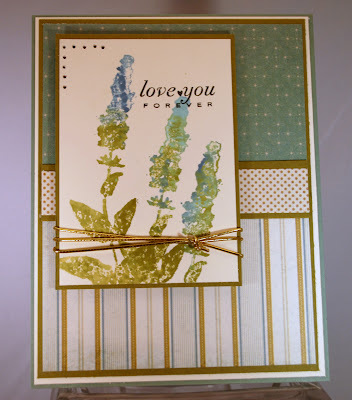 In this rendition, I was inspired by some scraps of designer paper I had on my table. I wanted to make a card for Operation Write Home that could be sent to either a male or a female, and I think the stripes, dots and colors are gender neutral enough to work for either. 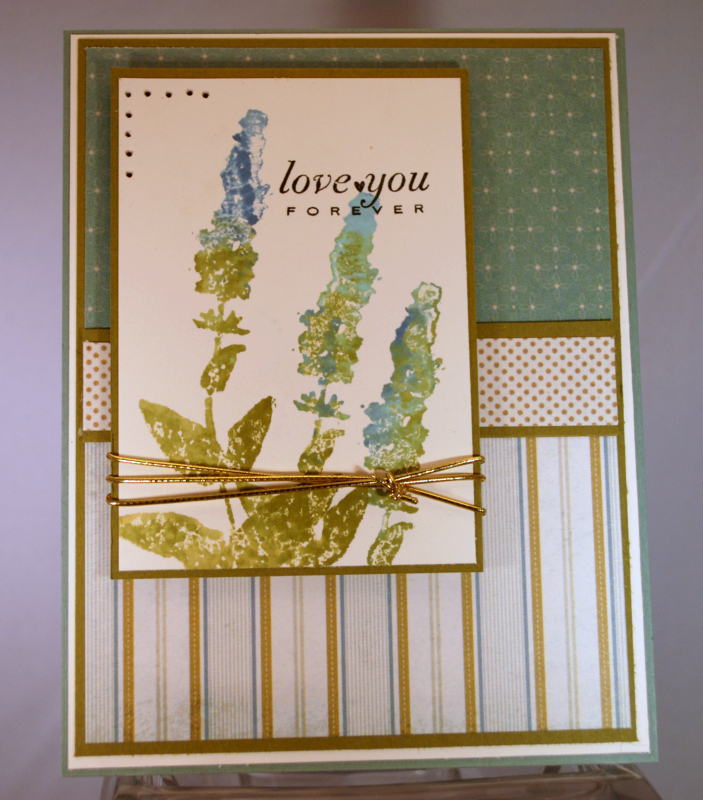 Anyway, I actually put the card front together before I considered what I'd use for my focal point and was stumped for a minute until I remembered this weed image from Wildflower Garden. I think the distress ink technique adds a nice softness to the rather stuffy stripes, and the colors help tie everything together. I added a bit of paper piercing to the corner for a little detail, and tied it up with gold cording (another go-to favorite! ), before popping the focal on with dimensionals. What do you think? Will it work for either a guy or a gal? Guess it depends on the eye of the beholder, but it works for me! So, how do you make gender neutral cards? Got any tips to share? Would love to hear your comments. Pretty (or handsome?) card, Kathy! I always seem to end up with trees of some sort on my masculine cards, but then they're too masculine to use for girls. And who am I kidding, I always make a new card anyway, instead of making up a whole bunch of one design! Love these colors, and you're right about the softening up of the stripes. You totally nailed it for a gender-neutral card. The card is dynamite - the colors and the papers, definitely a gorgeous card. I especially like your added paper piercing in the corner and how you layered all the pieces of the patterned paper. You absolutely nailed a gender-neutral card. LOVE the colors and patterns. I especially like the paper piercing in the corner and how you matted each of the patterned paper pieces. When I'm going for gender-neutral I tend to use the blues & greens like you did here. I also go more for hardware embellies rather than ribbon. Very classy, sophisticated color combo on this Kathy. I definitely think the simple paper patterns and the slightly abstract/loose feel to the image makes it gender neutral. I love how you knotted the gold cord too!